I have been busy for the last month with other tasks, but I have made some additions to my portfolio. I also have removed some positions. I will report on the progress of last month as well. I have removed 20-21 shares of KMR since I felt my position was overweight. I then bought 44 more shares of O (O share price has fallen greatly). I have added 500 dollars of cash to my Roth IRA. I am going to add 2000 more to my Roth IRA in the coming months to max my contribution. Once the cash settles I will buy more shares of REITs (I am eyeing ARCP and HCP right now). My taxable account ran out of free trades today. So I did a lot of trading to balance my portfolio more to my liking. The final portfolio of my Roth IRA + Taxable is shown below. The portfolio has recently crossed the $40k mark and now provides over ~$100 a month in dividends. I am quite happy with the dividends that I am receiving this month (September). The dividend amount is constantly growing and it is getting more noticeable. I am not able to pay all my utility bills using dividends. (with cash) … Avg Yield (no cash) Annual Divs …. ….. 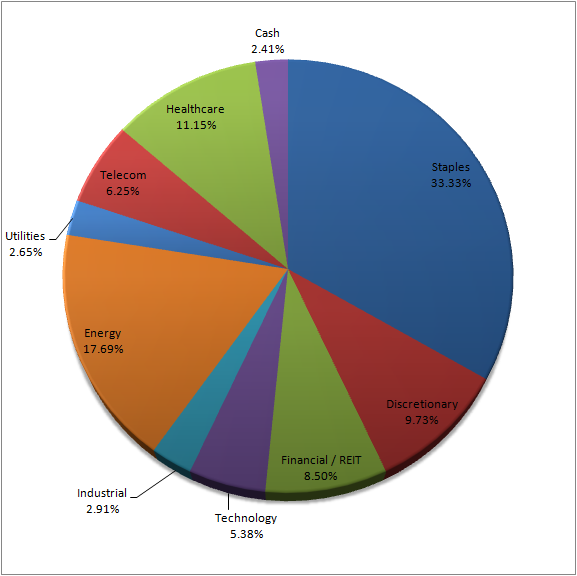 Since I have added more into REIT, utilities, healthcare, a bit into industrials, and removed some of my positions in energy, I was able to balance my sector weightings closer to my goal. I still want to keep the majority of my portfolio in staples since I prefer to be more conservative. 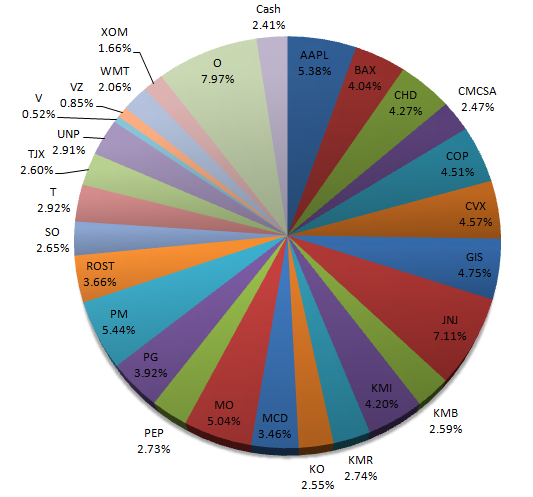 Below is a graph showing the weightings of the various companies that I hold. I am happy that I am now less weighted towards the Kinder Morgan companies (nothing against the company though!). My weighting in O is currently very high but that will decrease as I continue to add to other companies in the coming months. I continue to contribute to my company 401k and here is the list of Vanguard index funds that I still hold. The value of the funds has crossed the $10k mark.